We’re always looking for ways to ditch some wires in our performance rig. M-Audio just gave us a new one. They’ve unveiled a completely wireless set of products called MidAir, including 25- and 37-key keyboards and an upcoming MIDI interface you can use with any MIDI device, all with a 30-foot range and battery power. And here’s the big surprise: pricing starts at US$250 list. Thanks be to volume. Full details from M-Audio after the jump. You really can ditch all of your wires, because the MidAir is completely battery powered (9V, it looks like). 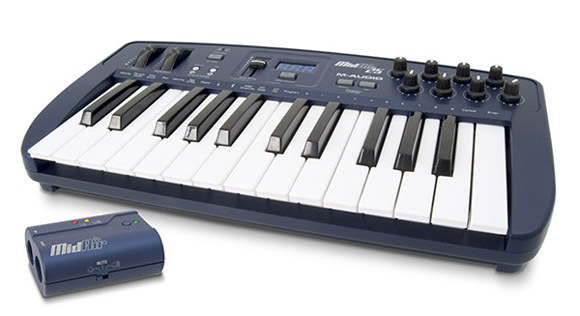 The remote unit is interesting, as well; M-Audio could have just left it as a USB paperweight that connects to your computer, but they chose to give it MIDI I/O, too, making it a useful MIDI interface on its own. In fact, the only thing missing is a strap mount, which would seem an obvious choice for a wireless device but M-Audio chose to leave off. Stay tuned here, as I’m sure someone will mod this into a strap-mounted keytar within days of it shipping. We can easily out-cool M-Audio, too, gang: I want to see a polished hardwood handle with light-up LED effects and a cowhide strap. M-Audio isn’t the first to make a wireless interface — we’ve seen them here before — but other versions have been clunky, ugly, and expensive. This looks simple, elegant, and cheap. It’s actually priced like a wired model; the premium should be really minimal at street pricing. If it lives up to its performance promises, it’ll be a huge hit. We’ll know for sure once we get a unit in for review. Tom at Music Thing was so inspired by this announcement that he posted a brilliant roundup of hot keytar action. Brilliant stuff, with insanely great keytar players.